Return of the '葱' [Negi]* !!! 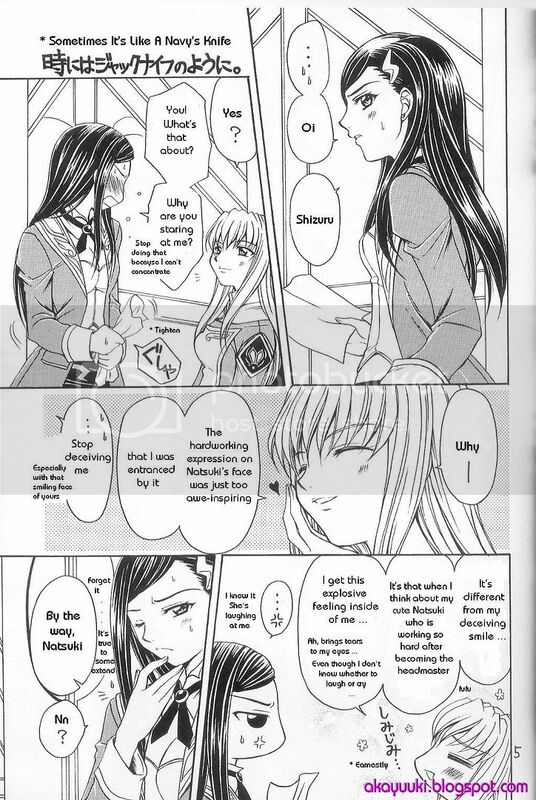 A parody of the Mai HiME Drama CD Volume Two, Track 2 haha. Alright, I took almost an hour on this, usually I can finish two pages in 30mins -.-||| Is that considered slow? Haha. I spent more effort this time to compare the Mandarin version with the Raw with this cool Japanese Word Processor. Kanji? No problem, I can type the Kanji with the Mandarin Word Processor, copy and paste on the Japanese Word Processor and viola, it gives me the meaning and Hiragana of the Kanji, cool eh? =). I'm trying to make the translated pages more professional looking and pleasing, instead of just mere erase, type and paste. Page 4's a killer haha, as I tried patching up the background with my lousy skills ... it's very tough but I think it looks ok ba XD. More [*] sidenotes to come on later pages as it gets a little 'thorny', I'm afterall just a self-learn-Japanese person, can't say everything is the best or very accurate. I'm still improving on it, hope you guys enjoy it and give me some comments will ya? Even lurkers too, thanks =). You're so sweet to post these. Oh god, LOL! That was so cute/funny! XD Thanks for posting it!